Ah. Historical accuracy. The interest of serious prototype modelers and bane of existence for period film makers. 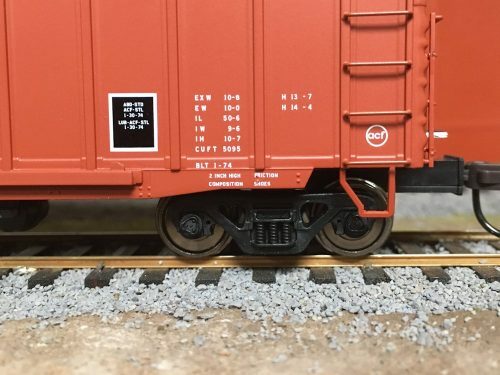 Modelers attempting to set their railroad in a particular time frame know that there are specific markers that can make or break the illusion that is being attempted. Things that can sometimes take a little (or a lot) of research to get right. Things like road markings and traffic signs (e.g. STOP signs were yellow prior to the mid 1950s), company logos in advertising signs and billboards, paint schemes and logos on railway equipment (such as CN’s iconic 1961 “wet noodle” logo or CP Rail’s 1968 “multimark” redesign), the particular equipment itself (like a particular boxcar design first introduced in 1979), and vehicles on the layout (“if it’s supposed to be 1969, who’s driving that ’74 Pontiac GTO parked at the station?”). This article will take a look at some of the specific freight car data and decals that when applied (or not) will firmly plant a car’s time period on one side or the other or the 1970s, and make a huge difference (along with an appropriate amount of weathering) in making the difference between for example a 1960-built boxcar in service in 1960, and a 1960-built boxcar in service in 1980. KarTrak ACI barcode label used during the early 1970s. ACI or Automatic Car Identification was, as the name implies, an experimental system in the 1960s to combine automatic identification of cars and their locations via coloured bar code labels that encoded the car’s reporting mark and number on each piece of rolling stock and trackside optical scanners that could read the labels to identify the cars as they passed. 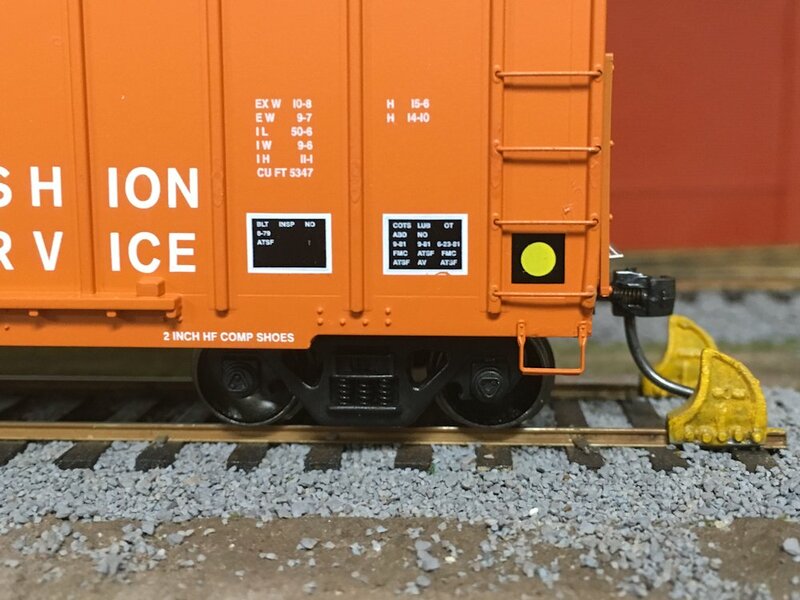 The data from the trackside readers would be fed into a computerized tracking system in order to improve the efficiency and accuracy of tracking the location and movements of railcars throughout the North American railway system. Beginning in 1967, the US Federal Railway Administration mandated the use of ACI labels on all new freight equipment, with a target date of 1970 to apply the labels to all existing equipment. However in 1977 maintenance and reliability issues caused the system to be abandoned. Dirt, rust, fading, vandalism and damage to the labels all contributed to an up to 20% failure rate in reading the labels. Therefore, after 1978 no new or repainted cars had ACI labels applied any more, and they could also be removed from existing cars, although many never were and while more and more rare now it is still occasionally possible to find an intact ACI label on cars with build dates from the mid 1970s that still bear their original factory paint. Early style single-panel COTS used on new cars from 1972-74. Sometimes also referred to as “COTS” (Clean, Oil, Test & Stencil) or, colloquially, “lube plates”, these distinctive white-bordered black boxes contained stencilled information recording the car’s build date and inspection and lubrication data for the axle bearings and air brake system. Prior to the 1970s, COT&S data was just stencilled on the brake system air reservoir and/or on a small patch near the truck bolster. Beginning in 1972, the Association of American Railroads began a program of applying this data in the now familiar consolidated stencil block to new and rebuilt cars. The early version was a white-bordered black box containing the stencilled data (see above image). In 1974, the Federal Railroad Administration began to mandate the application of these data blocks, and around the same time, the layout changed to a two panel design seen below. This was applied to new and existing cars throughout the rest of the 1970s. Alternate horizontal two-panel arrangement. 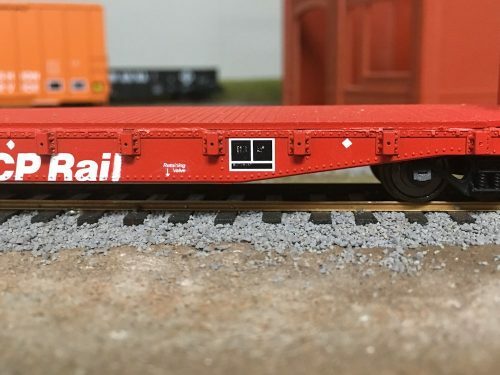 Particularly common on flatcars for obvious reasons. In the early 1980s, the consolidated stencil was modified and standardized to a smaller 3-panel arrangement (seen below) with two top panels for lube and test information, and a lower block that would indicate the cars built (and if applicable, re-built) date that would become the standard from 1982-2016. Around 1981 or 1982 a similar 4-panel block (with three upper panels and one lower strip) was briefly used, but due to its short longevity, was pretty rare. 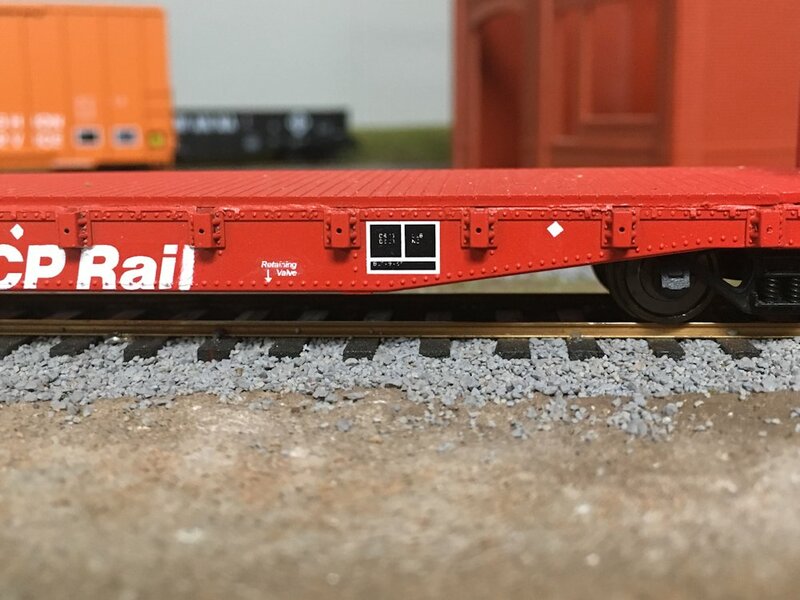 Post 1982 3-panel COTS block applied to a CP Rail flatcar. In 2016 the requirement for the consolidated stencil was dropped, and new or repainted cars no longer feature it. I’m still getting used to seeing freshly painted cars without that familiar black block – they feel almost naked somehow and that block was always a nice go-to for checking the car’s age if you could read the BLT date in the lower panel. Yellow circle/black square U-1 wheel inspection symbol, applied en-masse during 1978. This car also has a patch showing where an ACI label was removed for some extra historical flavour. In the late 1970s the common cause of a series of derailments was traced back to a defective batch of 33″ diameter steel ‘U-1’ wheels from the Southern Wheel Company. Accordingly, in March 1978 a massive inspection program involving all of the North American railways was implemented to find and remove from service all of the potentially affected wheels. All cars with 33″ wheels had to be inspected (cars with differing size wheels such as 100-ton cars with 36″ wheels were exempt), and if one of the U-1 wheelsets was found, the car was marked with a symbol consisting of a white circle superimposed upon a black dot indicating a wheelset that required replacing by December 31 of that year. Passing cars received a similar mark with a yellow circle in the black square. New cars built up to December 31, 1978 also received the yellow U-1 inspection. Once the inspection program was completed, there was never a requirement to remove the inspection marks, and these can still be found today on cars with paint dates older than January 1, 1979. 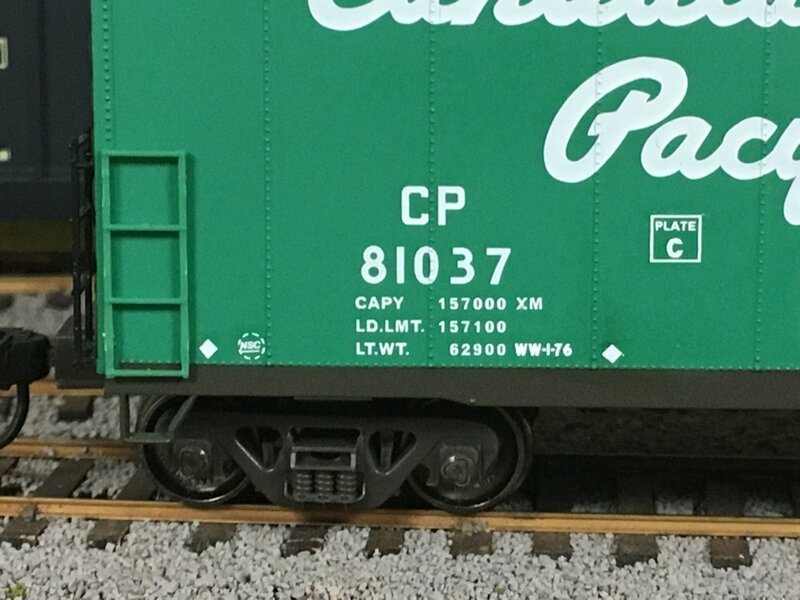 Weight data on a CP boxcar. “WW 1-76” at bottom right indicates the weight data was last refreshed in January 1976. This stencil is the most immediate and visible indicator of era on a freight car as it includes an actual hard date. The top CAPY line was also removed as redundant in the late 1980s. 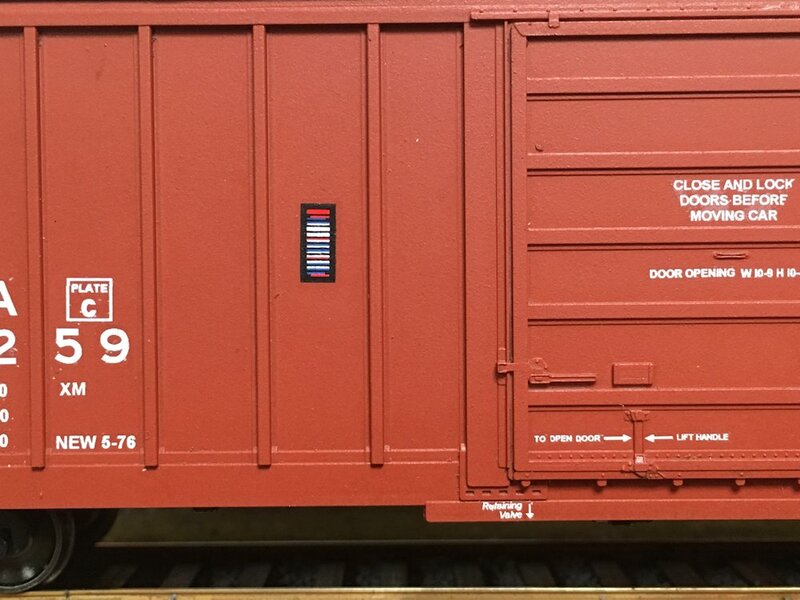 Below the reporting marks and car number on any* freight car you will normally find a collection of cryptic looking numbers and letters. Those three lines of data provide important weight information about the car. “CAPY 157000” – (Capacity) the nominal design capacity of the car, rounded to the nearest 1000 pounds. “LD LMT 157100” – (Load Limit) the actual maximum loading capacity of the car, rounded to the nearest 100 pounds. This number is calculated by subtracting the car’s light weight from the gross carrying capacity of the journal bearings. “LT WT 62900” – (Light Weight) the empty weight of the car, rounded to the nearest 100 pounds. “WW 1-76” – shop code (WW = CP’s Weston Shops (Winnipeg)) and date of the car’s last reweighing. This is also a key indicator of a car’s era. The initial weighing date for cars from the factory will be stencilled with “NEW” as the code. But let’s take a moment to talk about that “CAPY” line for a minute. By the 1980s someone finally realized that it’s actually rather redundant with the load limit, and in 1985 the CAPY line was removed from the lettering requirements, and indeed made to be removed from the cars themselves. So over the next decade following 1985, this line would end up being painted over on many existing cars, and no longer applied on new or repainted equipment. So this is another visual marker that would firmly signal a layout’s time frame as 1985 or newer. 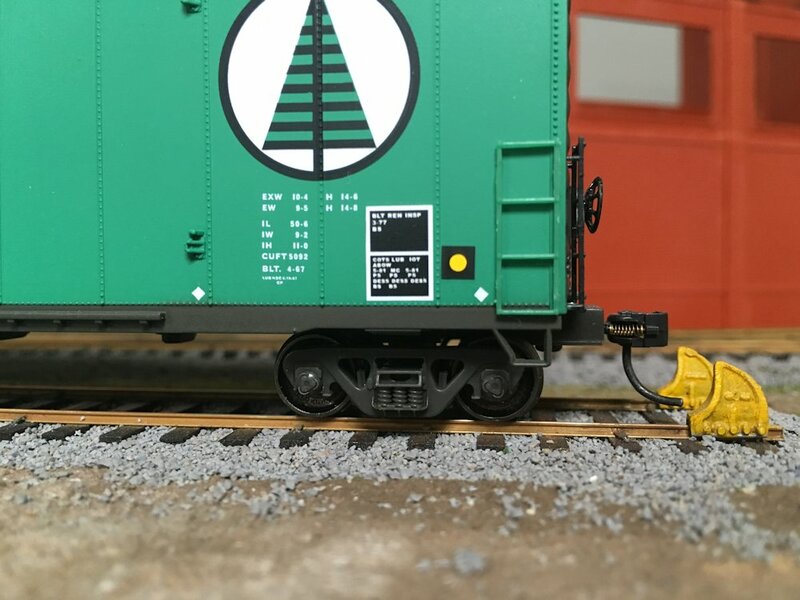 A Canadian regulation in 1974 required reflective marks to be applied to all new freight cars. Marks are to be applied on both sides with one located outboard of each body bolster and remaining equally spaced along the car; cars up to 56 ft. long (over end sills) to receive four marks per car, cars over 56 ft. long, six per car. Marks are to be 4” diameter or square (applied as a diamond) 3M Scotchlite reflective sheeting. These marks were applied as well to older Canadian equipment that was shopped and repainted. This requirement was Canada only, and not in the US. Looking at several photos of CPAA boxcars through the 1980s and 1990s it doesn’t seem to have been used even by CP and CN on their American service cars, or at least not consistently. Reflective markings became widespread on both sides of the border in the mid 2000s with the introduction of requirements for yellow reflective stripes (a.k.a. “Conspicuity Markings”) in 2005. Each country had a distinct deadline for compliance: 2013 in Canada, 2015 in the US. A number of cars were proactively marked in 2004. By rule, the yellow reflective marks must be renewed every 10 years. This was another Canadian-only requirement introduced late in 1979, which saw many tank cars in pressurized gas service have a 12″ wide orange stripe applied along the length of the car. 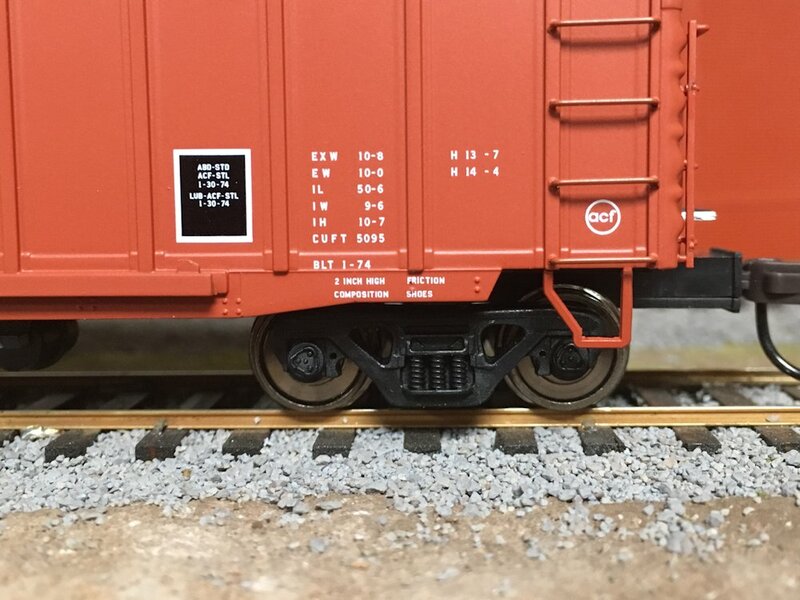 I’ve posted in more detail on this in a previous post: Freight Car Friday #54. This entry was posted in Freight Cars and tagged Data, Decals, Freight Car Friday by Chris van der Heide. Bookmark the permalink. This is great information! Very well done. Question: In my area I often see unit trains of various types, coal or M of W, or grain…the cars all look reasonably alike. Why do some of them, which look exactly alike, carry different weights, that are only different by +/- 100 pounds? Wear and tear, and repairs may cause a car’s weight to change slightly over its lifetime. While not clearly stated with the weight information, this is why cars will be periodically re-weighed, with the weight data updated and the new weigh dates applied. This is a great summary of these markings, labels, etc., and their dates of introduction and retraction! I’ll have this info on my workbench from now on when decaling/labeling my cars. Another summary I’d like to see in one place is the timeline for things like K-brakes, AB brakes, roof top brake wheels, high end brake wheels, low end brake wheels, elimination of roof walks, etc. You have done us a great service, thank you! I need to do some more information gathering on a few things but this could be a good part two. This is a fantastic summary of freight car stencils “through the ages”. Thanks for writing this… bookmarked for reference again and again. Changes in LT WT are due primarily to wheel rim thickness at the time of weighing. The weight of a wheel pair can vary by as much as 300 lbs between a new, so called ‘Multi-Wear’ wheel, and a fully service worn wheel. Per AAR Field Manual Rule 70, cars are to be re-weighed if alterations are performed that result in weight changes greater than published thresholds (depending upon LT WT). Great summary of this information. I knew some of what you’ve covered here, and while most of my modelling is 1950’s era, there is some really good bits and pieces for the more modern projects i occasionally undertake. 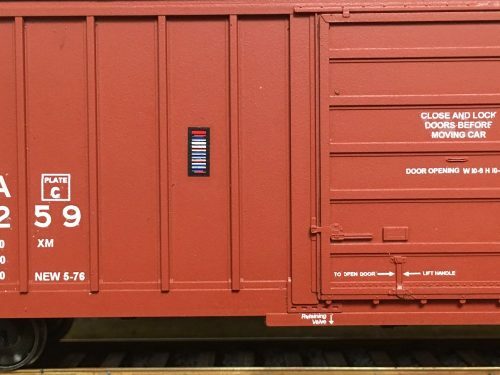 What does DES 6-74 mean on the side of a boxcar? I’m assuming you’re seeing this near the weight and capacity data. That would be the last re-weigh date. Whenever the light weight data is refreshed, the shop and date are also marked to indicate when the car was re-weighed. “DES” would be the code for the railway’s shop (possibly NYC/PC/Conrail’s Despatch Shops? – every railway had their own codes) that performed the weighing. 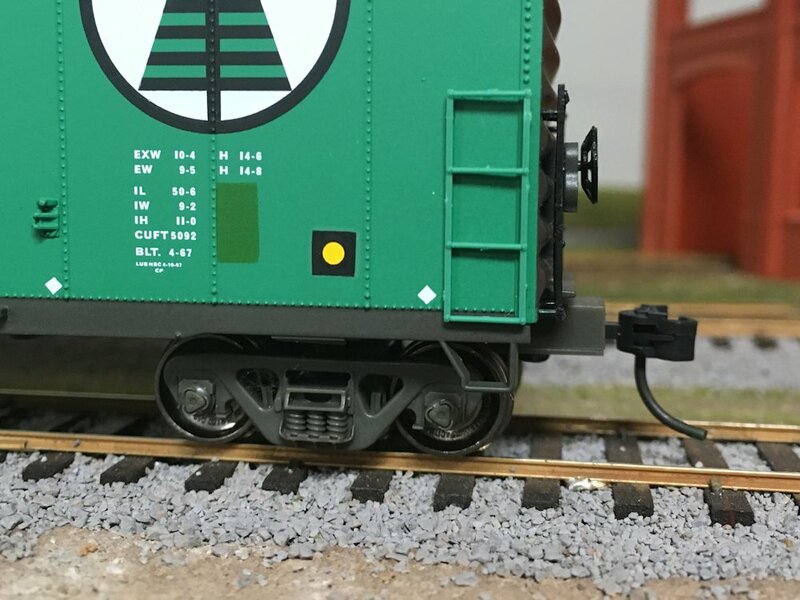 (On the initial weighing at the factory, the weigh date will be stenciled with “NEW”; at any subsequent re-weighings that will be replaced with a 2-4 letter code representing the railroad and/or shop that performed the work.) “6-74” is the date (June 1974).